John H. Burrow is an American/Canadian artist. He shares his love of nature with others through his work. John’s acrylic and oil paintings are always bright, full of color and imbued with a sense of joy and playfulness. When people see his oil paintings for the first time, they frequently comment about how good his work makes them feel. John’s past experience in the field of commercial art has given him the versatility to paint different genres. At a time when most artists attempt to get “branded” and paint in only one recognizable style, John is a renegade. He enjoys being able to express his warm memories of growing up in a small town using a folk art style. But when he wants to capture the beauty of an old farmhouse surrounded by a luxuriant garden, he chooses to use a more impressionistic technique. The Canadian landscape and the Group of Seven are also a source of inspiration for John. He can be frequently found painting en plein-air working in a freer and fluid, “painterly” style. John’s work is in collections all over the world. He accepts commissions and also conducts workshops for groups of aspiring artists. John H Burrow is a member of BC. 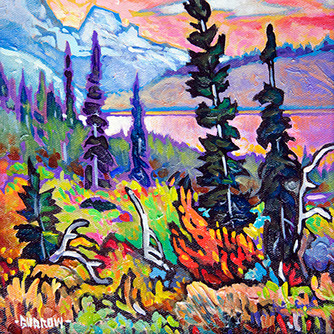 Plein-Air, Canadian Plein-Air Painters, The California Art Club, My Art Club, Laguna Plein-Air Painters Association, and The Shuswap Artists Group.